Last weekend I took L with me to do a little shopping and we ended up going to a family festival at the local shopping center. Many of the stores had booths with crafts and activities for the kids and coupons for the parents, so we both had a good time. A new paper craft store is opening and they had a table set up where they made these awesome little paper pockets for the kids. 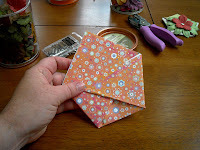 I watched as the lady spent approximately 30 seconds and went from a square sheet of paper to a cute holder for a business card and a bag of candy. It looked ridiculously simple, so when we got home, I took L's apart to make sure I knew how it was made. Don't worry, I put it back together. Then I sat down and made a few more. With some variations. Because I can. 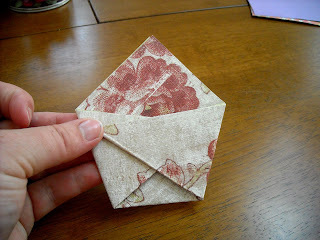 And I'll show you how to make your very own paper pockets. 1. 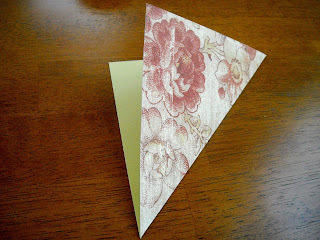 Take a square sheet of paper and fold it into a triangle. 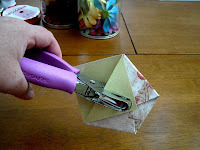 You'll want to make sure you crease all your folds well. 2. 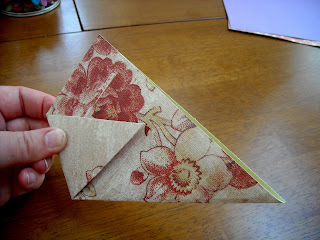 Fold one side corner in so that you get a fairly straight line across the top of the folded section. 3. 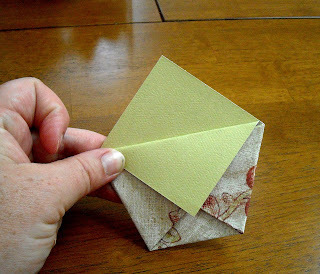 Fold the other side corner in just like you did the first one. 4. 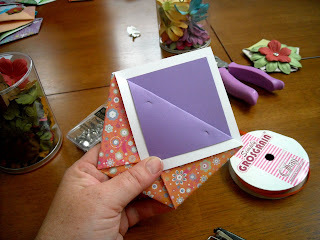 Fold down one layer of the top point. 5. Punch a hole through every layer except the back. 6. Put a brad through the hole. 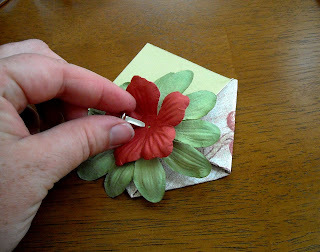 You can poke the brad through a couple of flowers first to jazz up your creation or you can leave it plain and classy. You're done! Now, let's say you want to get a little fancier with your paper pocket. 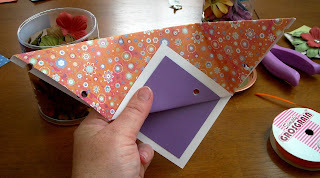 Maybe you have single-sided paper and you want something besides just white showing on the inside. Maybe you don't have any brads, but you have lots of ribbon. Here's a little variation on the basic one shown above. 1. 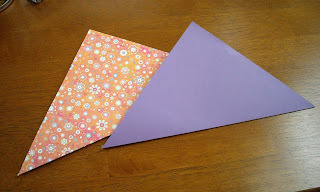 Take two square sheets of paper, one slightly smaller than the other and fold them both into triangles. 2. 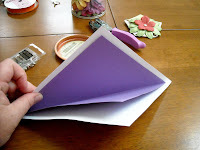 Position the smaller sheet inside the larger one and fold the pocket as shown in the example above. 3. 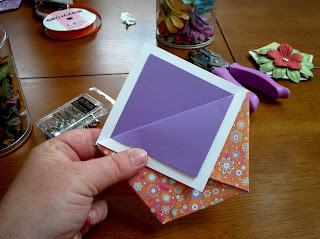 Fold down both the larger outer point and the smaller inner point. 4. You will need to punch two holes through all the front layers of the pocket, but a normal hole punch has a hard time with this. 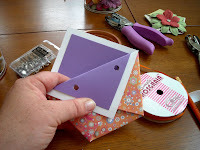 Use the hole punch to simply mark where you want the holes in the topmost layer. 5. Punch holes in each layer starting with the top. 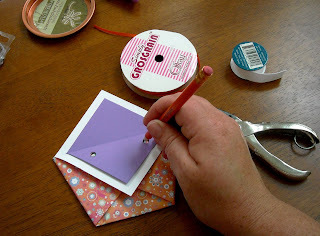 Once you have a hole punched, use a pencil to mark where to punch the hole in the next layer. 6. Continue to unfold and punch until you get each layer done. When you get to that last layer, just fold the top over and punch through the top holes. 7. Refold everything, thread the ribbon through the holes, and tie it into a bow. Now you can fill your paper pockets with whatever you can think of! 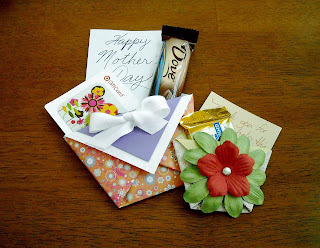 You can put in gift cards, gift certificates, notes, candy, flowers, toys, pictures, business cards, etc. These are perfect for giving little gifts for Mother's Day or Teacher Appreciation or end-of-year trinkets for the ladies at your MOPS table. You can do little thank yous or Valentines. It's incredibly easy and incredibly impressive. thank you! 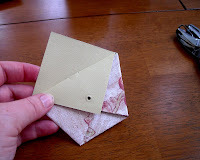 This helped me with some photos and photos I'm mailing, a neat little pocket to store them in, I'll use it often!